One of the worst things happened to us recently. My rowdy 5-year-old son crash-landed on his 13-month-old baby brother! While bubba was generally fine, I still knew something was wrong with him but wasn’t sure exactly what – it was either to do with this left leg or his right shoulder. We had seen three different doctors, and with the second one we realized it was, in fact, his right shoulder. With the third doctor, we had an X-ray of his shoulder done, which revealed a fracture in his collarbone. A sling was prepared for our little man, which he tolerated without too much fuss. He got lots of attention everywhere he went. If I were given a dime each time I had to tell the story of how it happened, I’m sure I’d be a millionaire by now. By the fourth day after the incident, bubba was basically back to normal. But he had to keep wearing the sling for another week. Two weeks later, a checkup appointment revealed that the fracture had healed well. Now that that was done and I could stop worrying about my poor brave bubba, it was time to start gathering ideas for my 7-year-old daughter’s and 5-year-old son’s birthday parties next month. I won’t go into much detail at the moment, but I’ll say that my daughter is having a Japanese-themed party and my son is having a robot-themed party. They’ll both be fun, but I think I’m partial to the Japanese birthday party! The combination of bubba’s injury and then party-planning have kept me quite preoccupied and you may have noticed that posts have slowed down here on the blog. Hopefully I can restore some regularity in the coming weeks, but I can’t guarantee anything, at least until the parties are over! 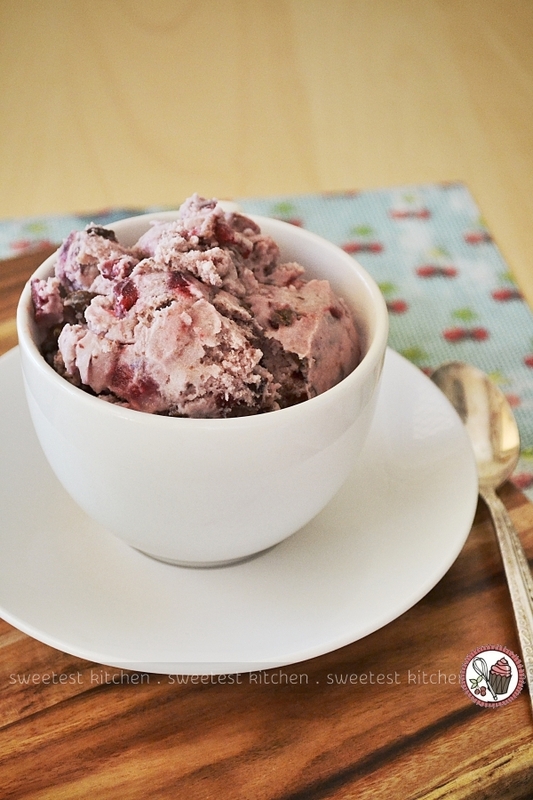 So today I’m going to bring you a healthy recipe for cherry chocolate chip ice cream. It’s not cherry season in Australia, but our local shop has been importing fresh cherries from the USA. I used these American cherries in this recipe. Despite the fact that this has been a cold week in Sydney, we’ve been enjoying this batch of ice cream which brings a little touch of warmer weather to our hearts. This healthier ice cream is made with coconut milk, vanilla extract, a hint of almond extract, honey, fresh cherries and chopped chocolate chips. 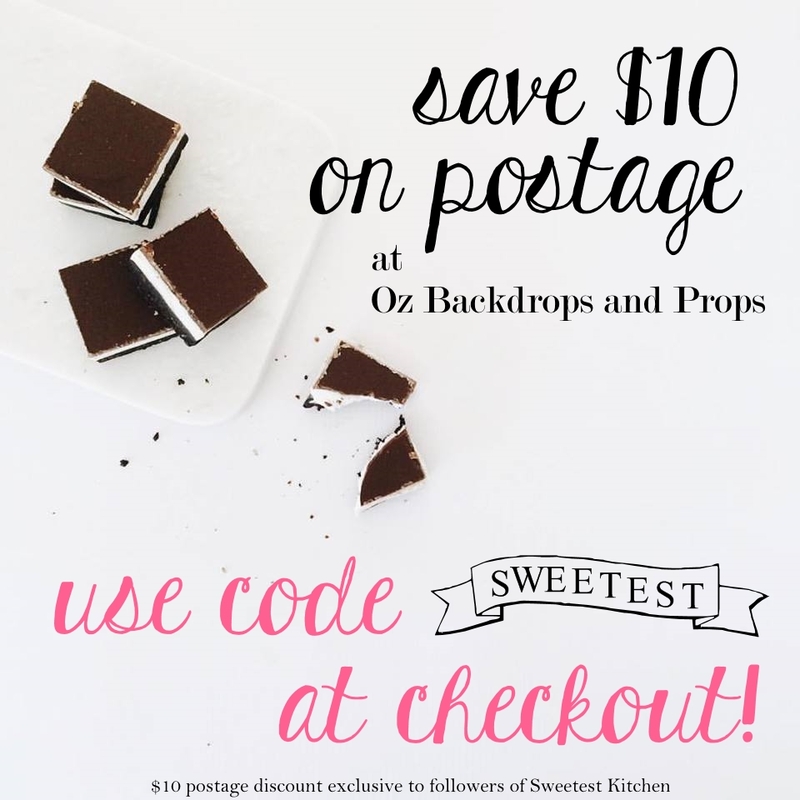 Depending on the type of chocolate you use, this recipe can be dairy-free, gluten-free, refined sugar-free, paleo, vegan, you name it! I just used regular chocolate chips from the baking aisle in our regular grocery store, so I can’t officially say that my particular recipe is any of those things! I’ve made a handful of dairy-free ice creams with coconut milk as the base and I haven’t liked them very much. This recipe, however, has the been the first one that I really liked, so I wanted to share it with you. The photos accompanying this post were taken the day after the ice cream was made, so it was a bit firmer and didn’t scoop out of the container well enough to form those nicely rounded dome tops. As you may know, homemade ice cream usually is firmer than store-bought anyway. It’s best to leave your homemade ice cream sit on the counter for about 15 minutes before trying to scoop it out. If you’re heading into summer with a basketful of fresh cherries, definitely give this recipe a go. Or if you’re in the Southern Hemisphere and have dreams of spring, have a go with some American cherries! You can even try frozen cherries instead. 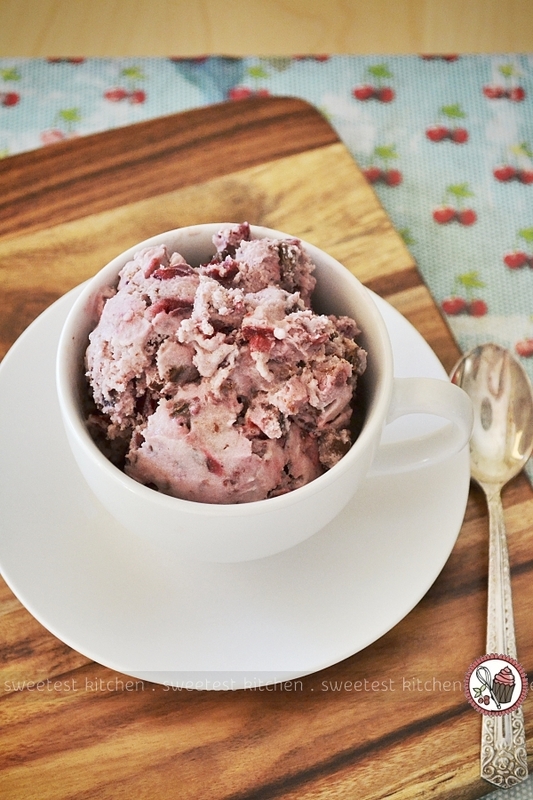 A delicious and healthy dairy-free ice cream with fresh cherries and dark chocolate. Set aside one fourth of the cherries, and finely chop remaining three-fourths of cherries. Place the whole cherries you set aside in a blender or food processor, and puree. Add all the liquid ingredients (coconut milk, vanilla & almond extracts and honey) into the blender or food processor. Do not add chopped cherries or chocolate chips yet! Blend on medium speed for about one minute. Stir in remaining chopped cherries into the mixture. Do not blend, stir only. Pour mixture into electric ice cream maker and churn as per manufacturer's instructions. Transfer ice cream to freezer-safe container and stir in chocolate chips, then enjoy immediately or freeze until desired consistency. For dairy-free, nut-free, refined sugar-free, vegan, etc., choose the appropriate type of chocolate. Im lactose in tolerate and possibly growing into a dairy intolerance as well, would soy or rice milk work just as well, or is it going to change the taste or consistency? I’m just reading over this recipe and thinking it looks pretty fantastic with the coconut milk. I think using a different dairy alternative would greatly change the consistency since a can of coconut milk is very high in fat which is going to help the consistency when you are freezing it. Do you have problems with nuts that you’d want to avoid the coconut milk? Personally I’m looking forward to having enough free time to make this as is.